What exactly is an Egyptian cartouche and what was its purpose? Cartouche Definition: A cartouche is an oblong, or oval, magical rope which was drawn to contain the ancient Egyptian hieroglyphics that spelt out the name of a King or Queen. The "cartouche" can be found on Egyptian monuments and papyrus documents and the magical rope was used to surround the name and protect it. The survival of the name, or Ren, was imperative to the Ancient Egyptians as they believed that the person would live for as long as the name was spoken. A person would be destroyed if his name was obliterated and great efforts were made to protect it. The name of the hated heretic Pharaoh, Akhenaten which would have b been surrounded by a cartouche were hacked out of monuments and deleted from documents to destroy all memory of this hated king of Egypt. The use of the cartouche started during the beginning of the Fourth Dynasty under Pharaoh Sneferu. Before this period the names of the kings and gods were written in rectangular frames. The cartouche was known in ancient Egypt as the shenu and is derived from the Egyptian word 'Sheni' which means to encircle. Although the cartouche usually contained the name of the Pharaoh occasionally the name of a god or goddess is also in a cartouche. This was especially the case for Osiris and Isis in temple hieroglyphic inscriptions. The cartouche was seen as a powerful protective symbol. In the tomb of the Pharaoh Tuthmosis III, in the Valley of the Kings, the entire burial chamber, as well as the sarcophagus, was constructed in the form of a cartouche. 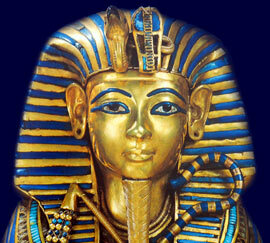 The protective significance of the cartouche symbol was also used when creating ancient Egyptian jewelry. The word 'cartouche' was first applied to the cartouche symbol by the French soldiers who were part of the 1798 military campaign led by Napoleon Bonaparte into Egypt. The French soldiers were aware that Napoleon Bonaparte had given orders that valuable Ancient Egyptian antiquities should be transferred to Paris and that the French scholars who accompanied the soldiers were interested in Egyptian history. The soldiers saw the symbol frequently appearing in the ancient Egyptian hieroglyphs and believed the symbol resembled a gun cartridge, or bullets - the words gun cartridge was 'cartouche' in the French language.